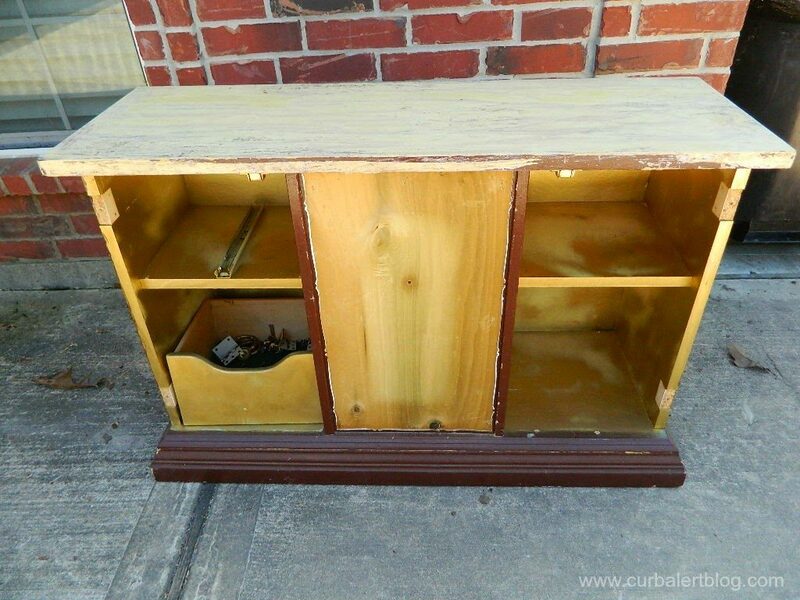 You are at:Home»Uncategorized»Rustic Glam Cabinet and Some New Friends! 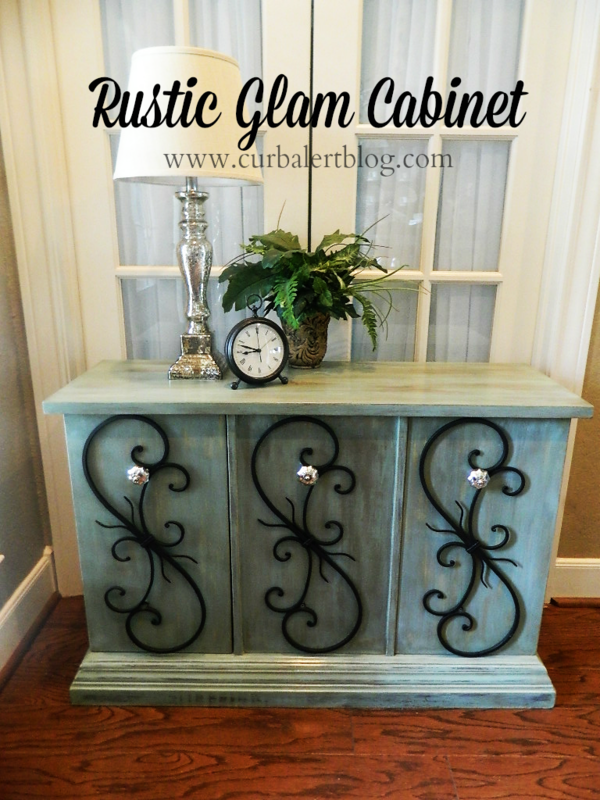 Rustic Glam Cabinet and Some New Friends! a new distributor just two minutes from my house! More like a crack dealer because now I am hooked! Hmmmm, what to paint, what to paint! I needed something to practice on and within hours discovered this piece at a nearby old historic church in our town. They were throwing it away and gracious enough to let me take it off of their hands. Here is a better look at it. It was screaming for some TLC and I knew I was just the person to do it! The inside, well, it had seen better days! 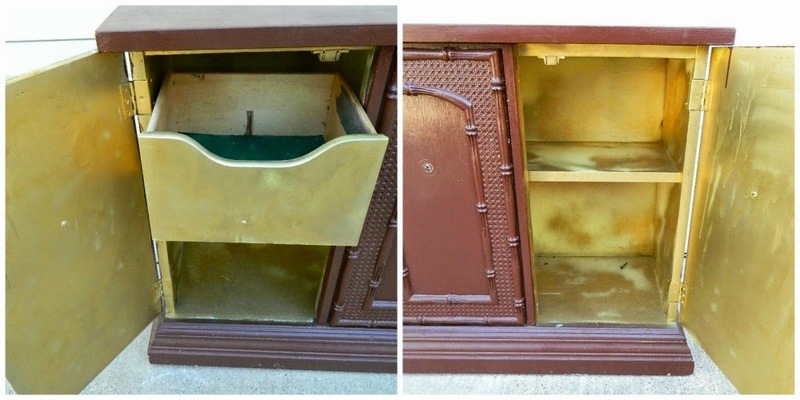 As much as I liked the little details on the doors, I realized that they were plastic so I decided to remove them and prayed the wood underneath was in good condition. Luckily it was! Now to the fun part! Paint! 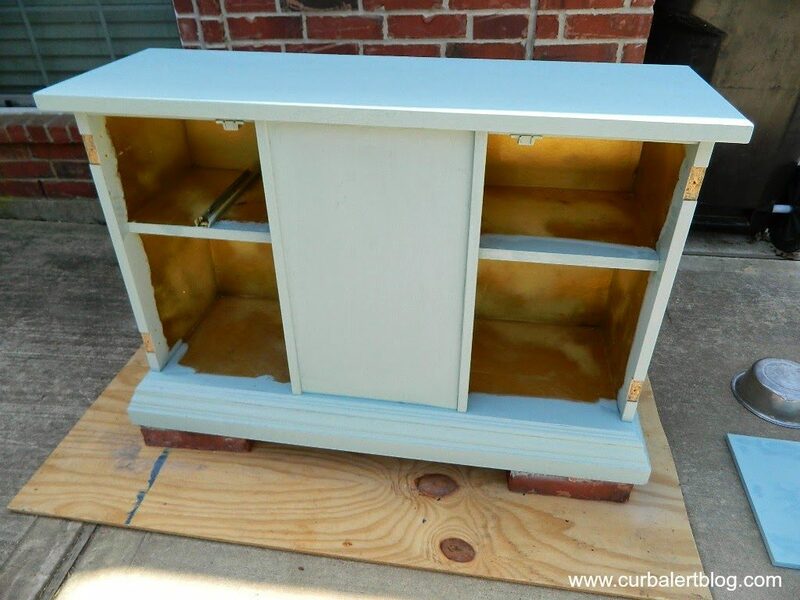 Here is after two coats of the Duck Egg Blue Paint. 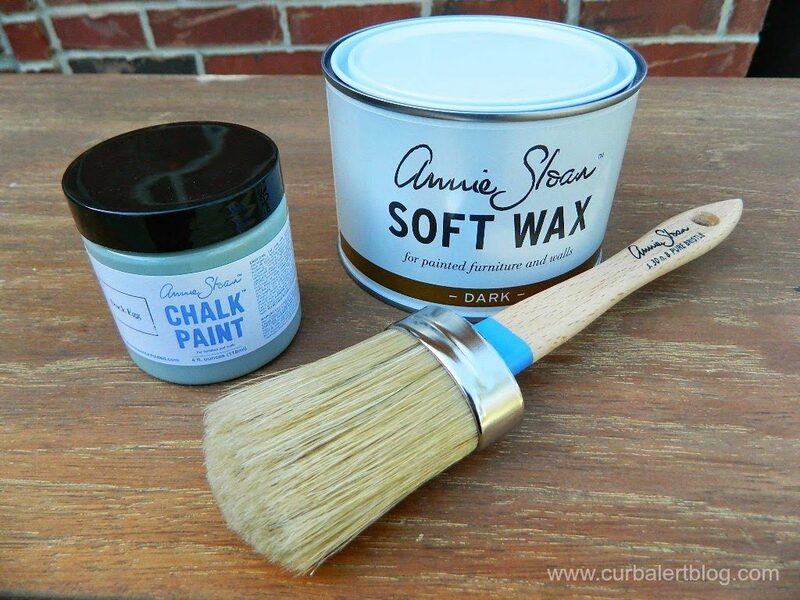 I then distressed it, sanded it a bit by hand and then added Minwax Clear Wax then Annie Sloan Dark Wax. The Dark Wax was tricky and I sure do need some practice on it! I felt like a true artist buffing my way through it until I got it just right! Okay now it looks just right, just the bit of Rusticness I was looking for – rusty hinges and all! That was the Rustic but let’s take a moment to look at the Glam. I purchased some shiny glass knobs at Hobby Lobby to match my mercury glass lamps. I love them, don’t you? 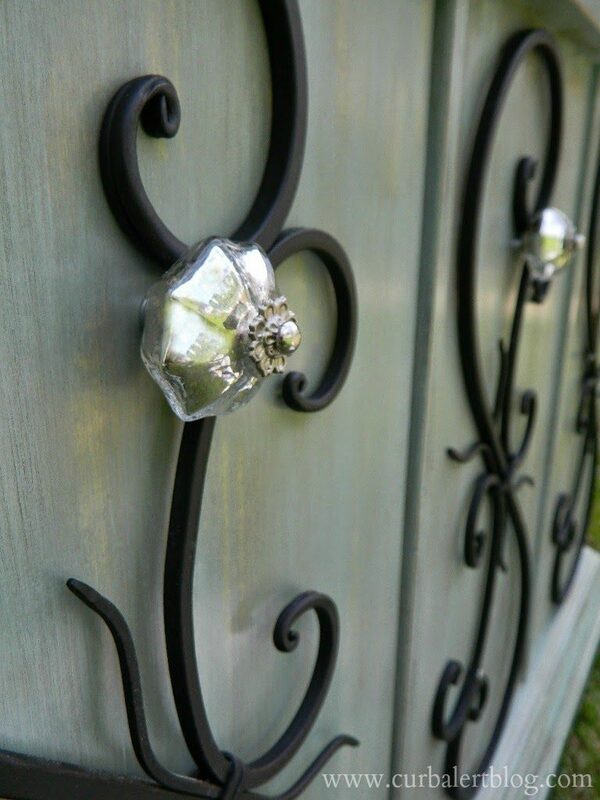 I found the pretty metal details at Hobby Lobby and think they are the perfect embellishment for the doors. Let’s not forget about the inside! 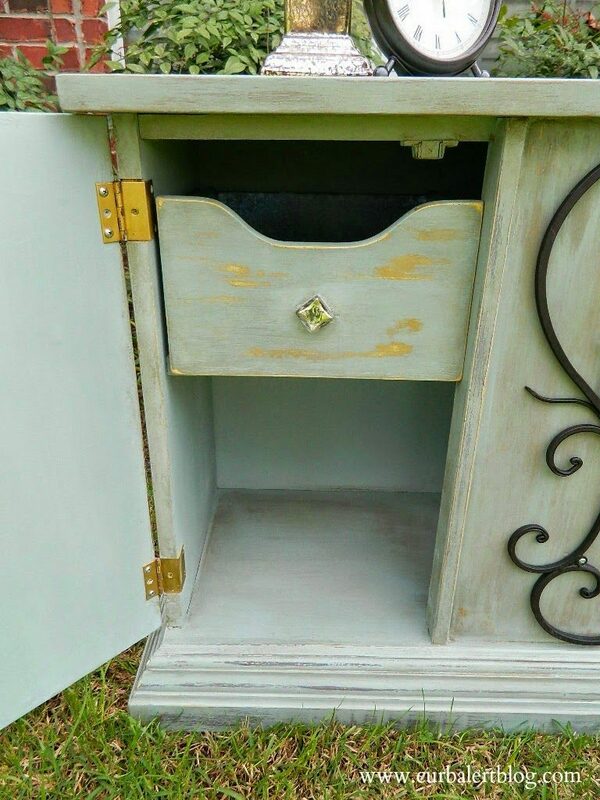 I didn’t distress or wax it as much as I did on the outside but I dressed up the drawer a bit with some Mod-Podge,Scrapbook Paper and a little Glass Knob to match the others. Oh boy, I am getting excited about this transformation! And here are a few more Glam Shots for you! 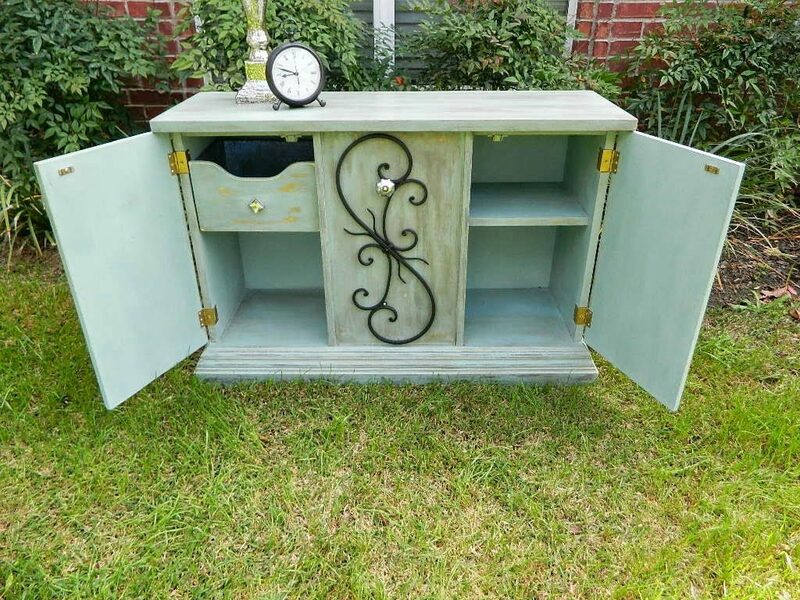 I am no expert but I think I did pretty good at my first attempt at Annie Sloan Chalk Paint. I love this piece so much, I really do it even matches my bedroom! 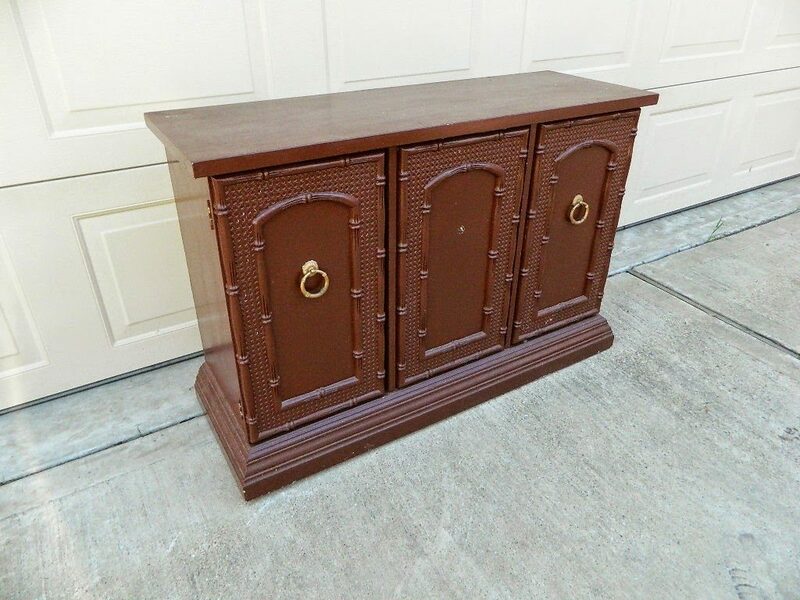 but I have been very blessed by this little piece of furniture and the people of the little church that gave it to me that I decided to donate it back to them. They have become my new friends and I have enjoyed getting to know them since acquiring this piece. I sure hope they like it. Do you think they will believe it’s the same cabinet? 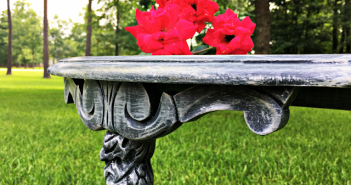 There are so many amazing DIY bloggers, it can be easy to miss some of the best posts! 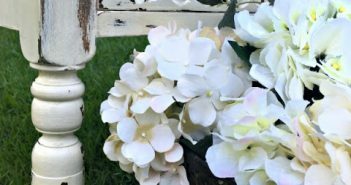 I have teamed up with some of my favorite DIY/Upcyling friends to bring you a NEW weekly DIY upcycling share post. Each week we will host a collaborative post with projects and links you may have missed. 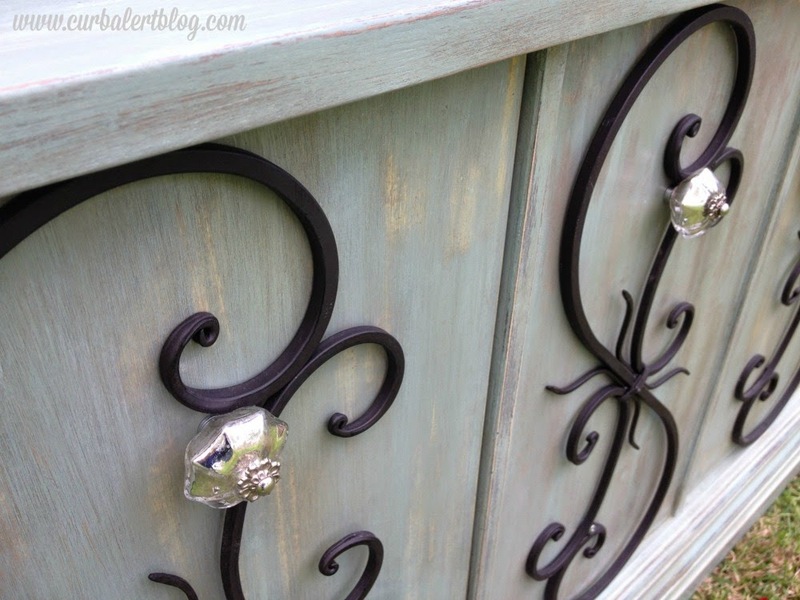 I hope you will spend some time visiting my DIY/Upcycling friends! 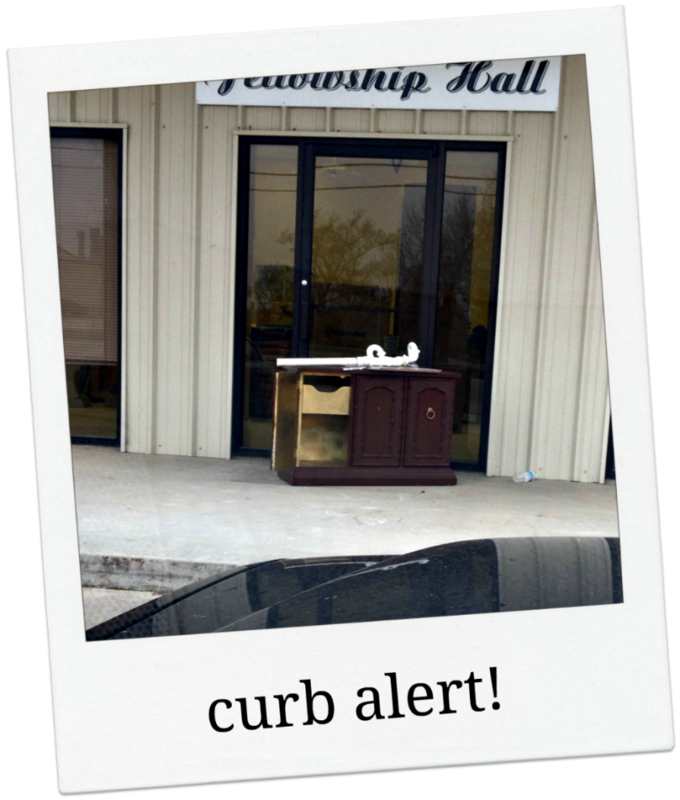 Karen from Redouxinteriors Katie from Upcycled Treasures Tami from Curb Alert! Soon to be more DIY friends joining in!! 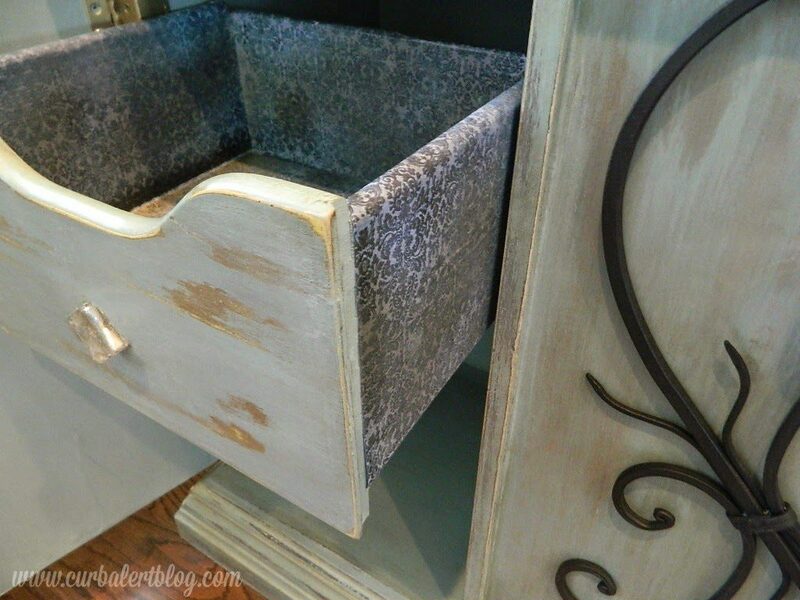 Upcycled and Rescued DIY Projects you may have missed! 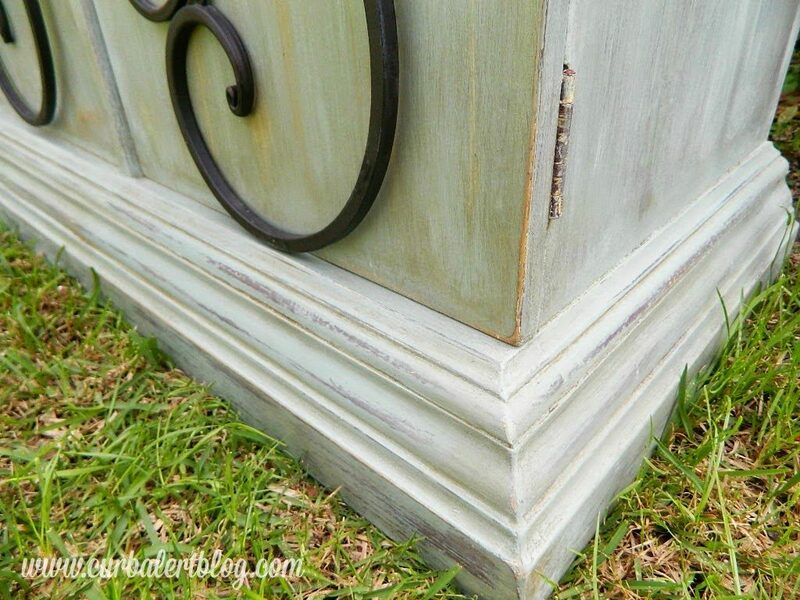 Katie from Upcycled Treasures made a mirror go Nautical with her Nautical Rope Mirror tutorial. Check it out to see how easy it is to make one! 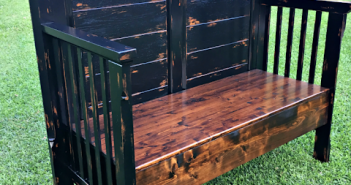 Karen from Redouxinteriors saved this chair from certain trash death. This chair got a major makeover. It was horrible and stained, but guess what, you can spray paint leather! Check out the post to see how. Now wasn’t that awesome? 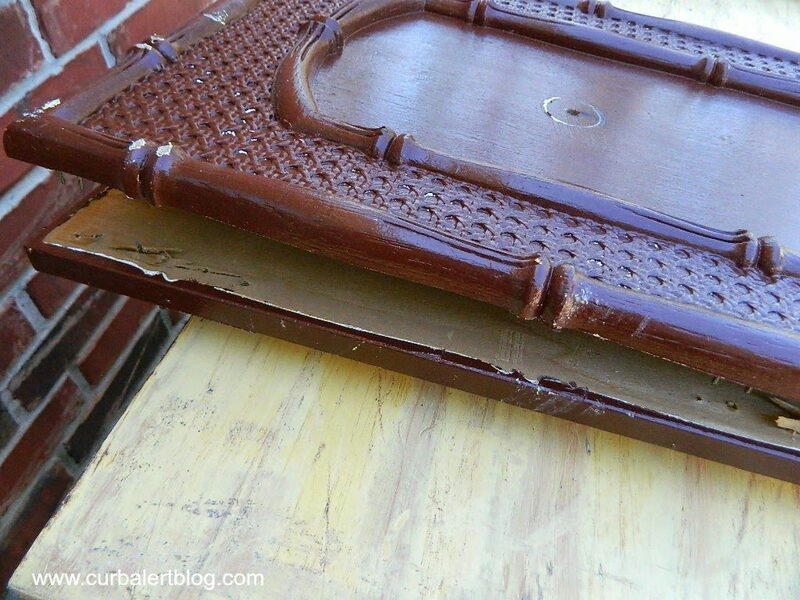 Now you have two new awesome DIY Blogs to add to your reading list! Stay tuned!! 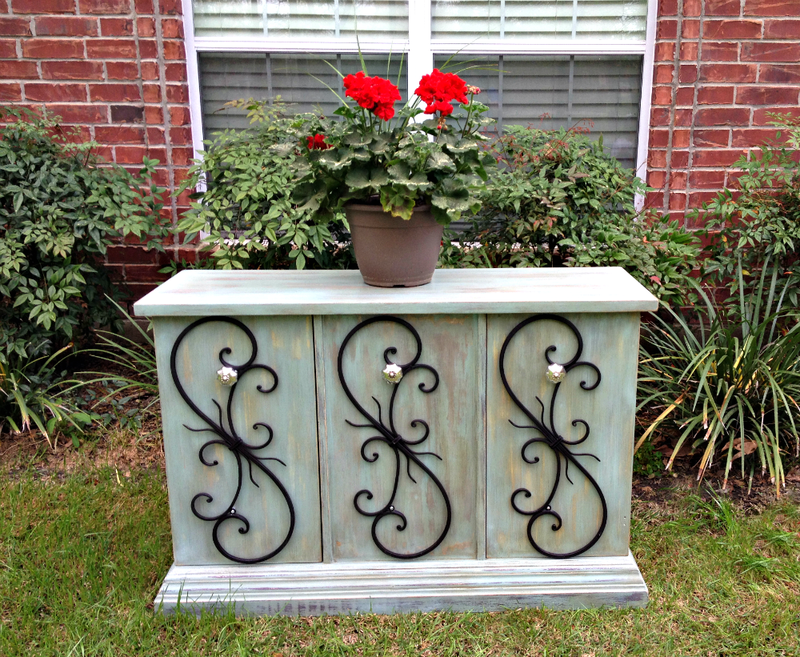 Each week we will bringing you more inspiring DIY’s, Upcycles and Curbside Rescues to inspire you. 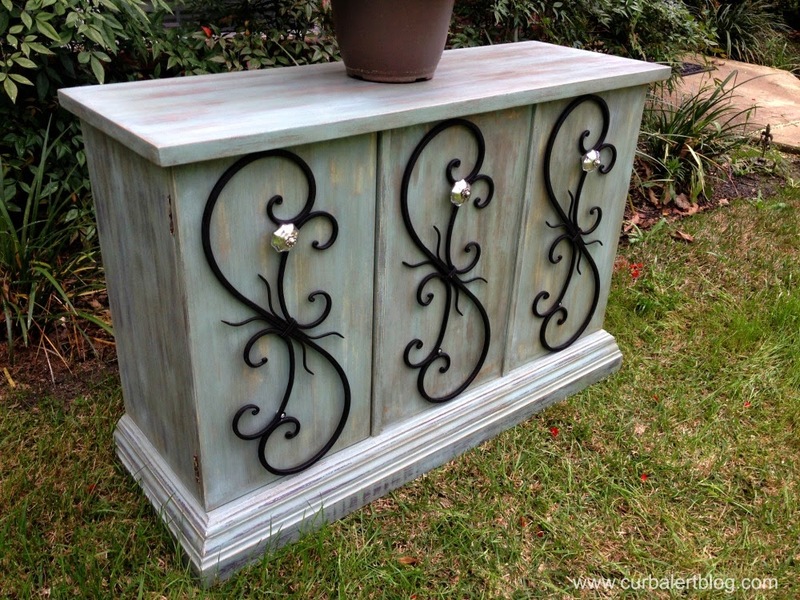 Next Article DIY/Upcycling Project Roundup! 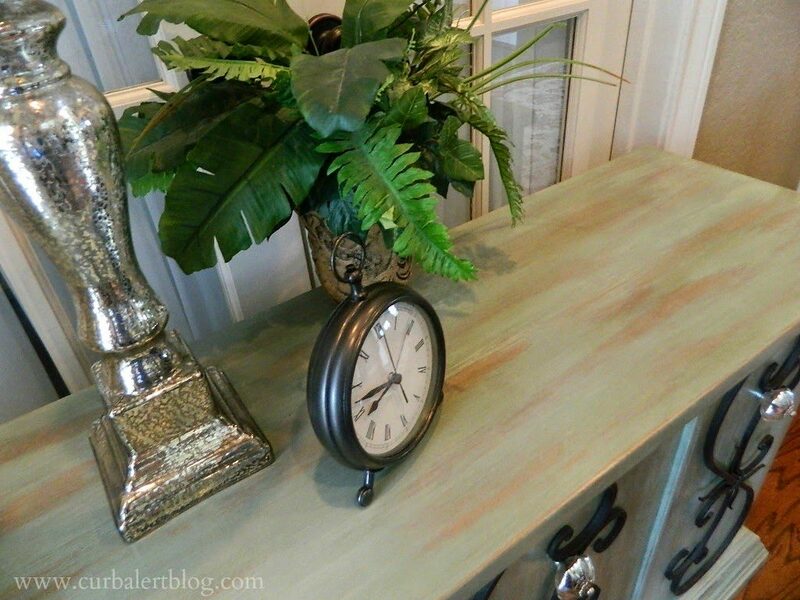 Tami your dresser looks awesome! I love that it was a throw away from an old church. Those are the best pieces! WOW – absolutely gorgeous Tami !!! I've been using ASCP for a couple of years now – was hooked from the first day also – CRACK house LMAO !!! This is gorgeous! You did a great job, and good on you for donating it back to the church, I'm sure they are amazed. I saw it on Redoux Interiors. See you later, I need to poke around your blog for a bit and see what other wonderful things you have done!